The Lady Amber and R/V Revelle in Honolulu. Two ships in Honolulu were abuzz with action this last week preparing for SPURS-2, a detailed study of ocean salinity in the eastern tropical Pacific Ocean. The Roger Revelle, upon which all the scientific party sails, had to be loaded with many tons of scientific equipment and installations completed all over the ship. Lady Amber, the 20-meter (66-feet) schooner, was also readied for action with the installation of meteorological and oceanographic gear. It was amazing to see what was completed in only a week under the supervision of chief scientist Andy Jessup (University of Washington). Containers from Seattle, Woods Hole, and San Diego were unloaded and equipment hauled to the ships. Many scientists and technicians dedicated the entire week prior to Revelle’s departure on August 13 for stowage, assembly, installation, testing, and securing of instruments and gear. It was a very quiet ship over the last 24 hours after we departed as everyone had a well-deserved rest and acquired their sea legs! 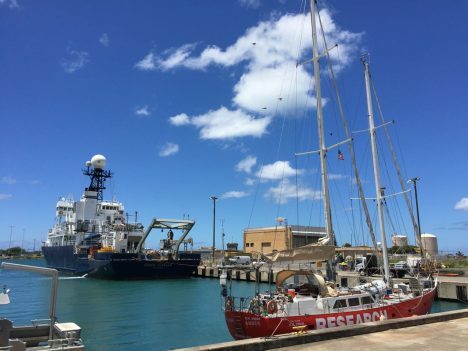 The Lady Amber crew successfully tested its new installation of scientific gear but suffered a schedule setback when the crew discovered that the ship required a new engine prior to departure from Honolulu. These arrangements are underway and we are appreciative of the support provided by the University of Hawaii as the Lady Amber work gets completed. Lady Amber is expected to leave Honolulu in about a week and catch up with Revelle at the SPURS central work site, eight days southwest of Hawaii. Argo the cat, relaxing in the Lady Amber. Weather was fine on Saturday afternoon for Revelle departure. 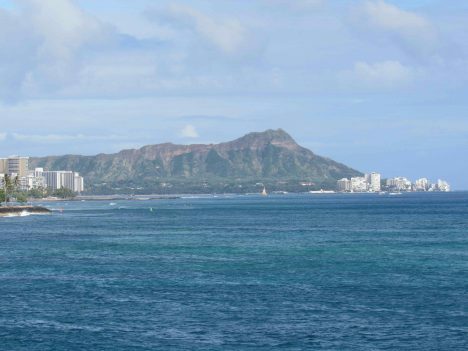 It was a quick trip out of the harbor with a great view of Waikiki skyline and Diamond Head. We passed by the Big Island of Hawaii on Sunday morning, August 14, giving people one last chance at cell phone calls. The island, really the largest mountain on our planet (from ocean bottom to summit), is a phenomenal sight. On Sunday we had our first of weekly safety drills. Everyone got to learn how to decode the various horns that call for assembly, all clear, and abandon ship. We learned about survival suits and life raft deployment. Especially, we learned how to be safe on the Revelle and watch out for one another. We were encouraged to see the expert knowledge and conduct of the crew in their drills. It is over 2000 miles from Hawaii to the site where we begin work in earnest (deployment of moorings that pack the after deck). In the coming week, as we make the transit, the primary occupation will be testing and checking out various systems and training everyone for the complex operations to come. Once we are on site, we will quickly enter 24/7 scientific operations and we hopefully will have worked out all the glitches! On a sad note, we had to leave our colleague Fred Bingham standing on the wharf in Honolulu, when we had expected him to sail with us. He was struck down with an illness that required he remain ashore and head home to Wilmington, North Carolina. His primary role in SPURS is as data manager. We are all assured that he will be on the mend very soon but we will miss his sunny manner and organizational skills. 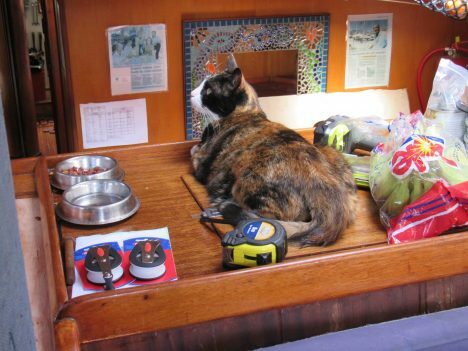 The scientific party aboard Revelle is quite diverse – from first timers to old veterans. I’ll try to introduce you to the team in the weeks ahead. I am happy to report that I have seen no severe cases of seasickness during our initial day at sea. No doubt a few people are feeling a bit “green” but all are adapting well. As always, I welcome your comments and suggestions for this blog. Send your messages to ejlindstrom@rv-revelle.ucsd.edu (case sensitive!). The expected frequency of the blog will be about one every two days. This entry was posted on Monday, August 15th, 2016 at 11:16 am and is filed under Salinity Processes in the Upper Ocean Regional Study (SPURS). You can follow any responses to this entry through the RSS 2.0 feed. Both comments and pings are currently closed. Can’t wait to read updates as you go.